The aim of this study was to investigate whether fimasartan, a novel angiotensin II receptor blocker, modulates hemolysate-induced inflammation in astrocytes. We stimulated astrocytes with hemolysate to induce hemorrhagic inflammation in vitro. Astrocytes were pretreated with fimasartan and then incubated with hemolysate at different durations. Anti-inflammatory cell signaling molecules including Akt, extracellular signal regulated kinase (ERK), NFκB and cyclooxygenase-2 (COX-2) were assessed by western blotting. Pro-inflammatory mediators were evaluated by real-time RT-PCR and ELISA. The stimulation by hemolysate generated a robust activation of inflammatory signaling pathways in astrocytes. Hemolysate increased the phosphorylation of Akt at 1 h, and ERK1/2 at 20 min compared with the control group and promoted the degradation of IκBα. Pretreated fimasartan significantly decreased hemolysate-induced phosphorylation of Akt and ERK1/2. In addition, fimasartan also suppressed NFκB-related inflammatory pathways induced by hemolysate, including reduction of the gene expression of NFκB, and decreased nuclear translocation of NFκB and degradation of IκB. 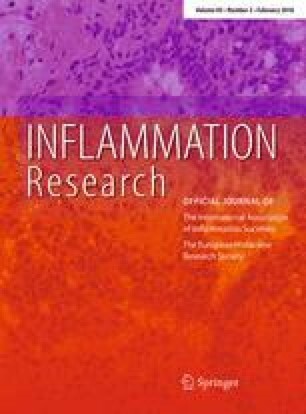 This reduction of inflammatory upstream pathways decreased the expression of inflammatory end-products: COX-2 and interleukin-1 (IL-1β). Furthermore, the expression of COX-2 was attenuated by both Akt inhibitor (LY294002) and ERK inhibitor (U0126), and IκBα degradation was suppressed by LY294002. These results demonstrate that pretreatment with fimasartan to astrocytes suppresses the inflammatory responses induced by hemolysate. Akt, ERK and NFκB were associated with hemolysate-induced COX-2 and IL-1β expression. Based on these mechanisms, fimasartan could be a candidate anti-inflammatory regulator for the treatment of intracerebral hemorrhage. X.- L. Yang and C. K. Kim equally contributed to this work. The online version of this article (doi: 10.1007/s00011-015-0895-9) contains supplementary material, which is available to authorized users. This work was supported by grant from the Boryung Pharmaceutical Company (800-20150256), and the Health Fellowship Foundation (2014-810115), Seoul, Republic of Korea. The research was also supported by a grant of the Korean Health Technology R&D Project funded by the Ministry of Health & Welfare, Republic of Korea (HI14C1277). The funding organization had no role in the design, conduct, or analysis conducted during this study, or in the preparation of this report.